About George H. Message George H.
Having travelled the world extensively, and been on private tours organized by the best tour companies, I would recommend Gerges as a guide most highly. His knowledge was broad and wide, he was patient, very friendly, and most accommodating. His main consideration was making sure I was happy with my tour, and he did everything in his power to ensure that was the case. Can't wait to return to Luxor and have Gerges be my guide again. And Mohammed the driver was fantastic too- most highly recommend Gerges. Gerges was an excellent guide for us. Most hospitable and caring. His was very knowledgeable and made the most of each site visit. He helped us with our desire to get off some of the main busy sites. We learned so much about the ancient and current history of Egypt. His English is very good. He also assisted us in many of the other things we wanted to do. He made our trip to Luxor very special. We would defintly use Gerges again and highly recommend him. As Americans, we were a little unsure about Egypt. But after visiting Luxor, we are looking forward to another trip! Gerges not only provided guidance throughout the sites, he was able to explain the history and context. We have been on many tours throughout our travels, and have had many many tour guides. Not many stand out like Gerges. College educated, articulate and knowledgeable. One of the best guides we have had. Very professional, informative and safe tour! We have a tour with Gerges S at Luxor for half day... He is doing a really good job to explain a lot of thing for us.. He is knowledgeable tour guy. We saw the way he love his country and histories of Luxor also.Thank Gerges so much for everything you gave us. George provided excellent airport drop off for my flight back to Cairo from Luxor. George provided excellent airport pick up as I flew in from Cairo for a day trip to Luxor. This was an amazing experience for anyone with only three or four hours to spend in Luxor and see some amazing sights. George provided excellent service, both in the information he provided about the Karnak and Luxor temples, and in the airport pick up and drop off. 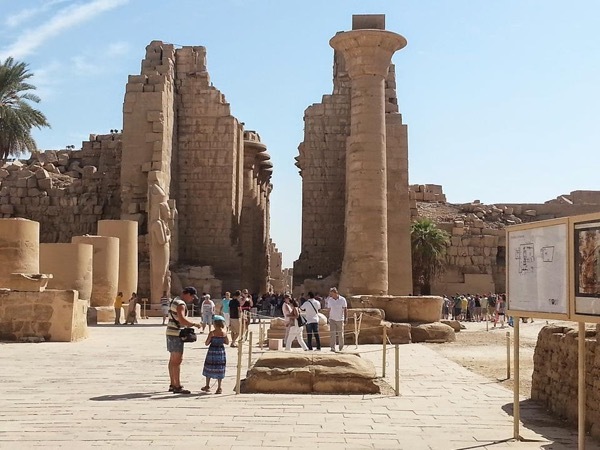 I learned a lot about the Luxor and Karnak temples, and feel convinced to come back at some point in the future to see the other side of Luxor with the Valley of the Kings. I highly recommend having George as a tour guide. Gerges was a well-informed and enthusiastic guide who made our day in Luxor most memorable. Gerges was flexible and accommodating to our particular needs during the day and he was considerate of physical limitations and client comfort. I would recommend Gerges to any travellers. Very informative and Gerges accommodated to our time needs. And very lovely!! George was a good guide and very knowledgeable about all Egyptian history. He was punctual and the car and driver fine. I would use George again the next time I vist Luxor. TOUR GUIDE RESPONSE: Thanks a lot Chris and i hope to see you again. The airport pick up that George orgabized for us worked perfectly. George was waiting for us in just outside the airport and the car tha we used was modern, comfortable and in good condition. The driver was calm and not aggressive. TOUR GUIDE RESPONSE: Thanks a lot Michael , I'm glad that you are enjoyed & happy from my guidance services and from my driver as well . George is the best guide you van find in Luxor, he really make a difference for us. He knows everything that you need to know and he is wiling to explain to you in a way that for us was excellent. We are frequent travelers and we love history, so having a guide like George helped us to get the most of the experience! Thanks for everything George!!! TOUR GUIDE RESPONSE: Thanks a lot Michael, It's my pleasure to know that you enjoyed on you tour with me and i hope to see you again in Egypt . Gerges provided a good tour of Luxor. He was flexible with the start time (able to start at 6am) and showed up on time with new and comfortable car. Gerges was knowledgable about the various sites in Luxor. Only two minor issues. At times, we felt Gerges was a little frustrated when we were not paying attention to his discussions Egyptian history. Also, it would have been nice to sit down for ~2-3 mins in the hotel lobby before we started to discuss our expectations for the day. TOUR GUIDE RESPONSE: Thanks Sean but you miss understand me, im not frustrated at all im just want to see you and your friends happy and understand every thing, and also when you sit down in the hotel lobby i thought you have problem about your accommodation with the reception so im just want to help you, by any way great you are satisfied and enjoyed with me and hope to see you again in luxor. Gerges was very punctual and responsive to my time constraints. He was also very knowledgeable the thorough during the tour. He was able to customize the content and provided me with enough context, so that I could better understand what I was seeing. I highly recommend him. He does a great job, and he cares about his customers. TOUR GUIDE RESPONSE: Thanks alot David and i hope to see you again in Egypt. Georges was wonderful. He had an amazing knowledge of Egyptology and made our trip both enjoyable and educational.Thank you Gerges . TOUR GUIDE RESPONSE: Thanks alot Anusha and i hope to see you again in Egypt. Gerges was very professional and considerate of our diverse needs, as we were travelling with small children and grandparents. We had only a half-day with him, but we managed to pack in a lot, thanks to his expertise. Many thanks. Gerges was an extremely informative tour guide and knew the history of the Egyptians in great detail. The tour was superb and even entailed translations of hieroglyphs. I was a little disappointed on the expectations of large constant tipping, commissions and inflated prices if you wanted any further services. Overall the tour was excellent. TOUR GUIDE RESPONSE: Thanks alot Malcolm . TOURSBYLOCALS RESPONSE: ToursByLocals has a 'no tipping' policy. We have re-iterated this to Gerges that it is unacceptable to expect tips. George is a very informative tour guide, and going with him was a great way to efficienctly see everything I wanted to see in a managable time frame. He picked me up on time from the train station and we headed directly to the West Bank, followed by the East Bank and Luxor/Karnak temples. He provides a great backgorund and color to what you see, and I would highly recommend going with him. Karnak is completely amazing. The Sound and light show is a little cheesy, but if you are up for that, it is pretty stunning to be in this powerful place. TOUR GUIDE RESPONSE: Yes Colm karnak very powerful place. George is a brilliant guide. Always attentive, he looked after me, and my family, very well during our trip to Luxor. He was a source of good information and made sure we got the best out of our trip round many of the great sites of Luxor. I would thoroughly reccomend him to anyone travelling to this magnificent place. TOUR GUIDE RESPONSE: Thanks alot Colm and hope to see you again in Egypt. Gerges is a great guide and very knowledgeable about Egyptian history. We had a fantastic time visiting Luxor and Karnak temples with him and would strongly recommend him to anyone visiting the area! We highly recommend Gerges (George) as a tour guide! He was very knowledgeable, great with our kids and extremely attentive to our needs. Did a great job explaining the various aspects of the temples and showing us the highlights. After the tour he helped us check in at our hotel as we were an early arrival. TOUR GUIDE RESPONSE: Thanks alot Anne. It was my pleasure to show you and your family around and to explore the secrets of the Egyptian civilization and was great that you liked Luxor tours. I also enjoyed your family company, a wonderful family and I hope to see you and your family again. Thanks George!!! We had a fun and fantastic time...one of the best experiences ever! Even my son who has a fear of heights thoroughly enjoyed our hot air balloon ride. Highly recommended....George thanks for giving us an easy, hassle-free tour.